I Can’t Pay My Bills, Now What? So you can’t pay your bills. There’s too much month left at the end of your money. Now what? First of all, don’t panic. You can get through this crisis, but you need a clear head to do it. Worrying only makes things worse. Trust me. Make sure you are not trying to tackle things while you’re full of fear and anxiety. Practice some self care and come back when you have had a moment to breathe. Now, take a deep breath. We are gonna get through this together. First of all, it’s important to know that you are not a failure. This has happened to many many people before you. You are more than a pile of bills. They don’t define who you are, and though it may seem like it now, they do not control your life. There are steps you can take to rectify this situation, and later, we’ll talk about what to do so this doesn’t happen to you again. If for some reason your spouse or partner is unaware of this situation, tell them now. Waiting will only make things worse. If you put off telling them not only are you being dishonest with them, but you run the risk of them inadvertently making the situation worse by spending money you don’t have. Do you have anything at all you can sell quickly on Craigslist? Is it possible to donate blood plasma for a few extra bucks? Can you cancel your cable before the next bill is due? Look at anything and everything that might possibly give you some breathing room. Look at what is due and when. If you have a bill that’s due on the 7th of the month, can you pay it on the 15th without penalty? Take a look at the big picture and see if anything can be shuffled around. See if there’s any way to move one or two bills to the next pay period (but make sure that won’t totally screw you next paycheck or you’re just delaying the inevitable). If things are temporarily tight due to an unexpected expense, call some of your creditors and ask about a payment plan. Many times they are willing to do a “promise to pay” by either setting up an automatic payment on a set day, or sometimes just on the honor system. You might be surprised that they are willing to work with you and sometimes this even avoids disconnection or late fees. Being up front with them and trying to work out a deal can help you avoid being sent to collections and having to deal with a debt collector. In the event you’ve done all the above and nothing is going to work, you’re going to have to do some damage control. Take another deep breath. It’s time to make some difficult decisions. Look at what your bills are. Decide where your priorities lie. At this point, we’re talking bare essentials. Your rent or mortgage needs to be paid first. No matter what, you need a place to live (unless you have someone you can live with temporarily). Next most important on the list are water and electricity. If you work your way down the list and you don’t have money for the internet bill, then it gets shut off until you can pay it. Don’t have money for gas to put in the car? Then you’re taking the bus or getting rides from friends. Figure out what absolutely MUST be paid, and work your way down the list of priorities. I realize this literally is not an option for many people, however if you have anyone you can ask for help it is time to swallow your pride and ask. Ask not only for a loan, but ask them to help you come up with a plan both to deal with this situation and one so that it doesn’t happen again. Take another deep breath. This time tell yourself this is the last time you will be stuck without a safety net. You’ll need to create a budget, get some great personal finance books (even from the library if you don’t have the money). Get your budget in line, do whatever you have to do to pull yourself out of this hole and start taking steps forward. You don’t have to be stuck in this cycle forever. This could be your “rock bottom” and things could change. It’s up to you. You CAN do this. If you take a victim mentality and think that you’re going to be trapped in the cycle of debt forever, that is exactly what will happen. Think positive, make a plan, and get it done! 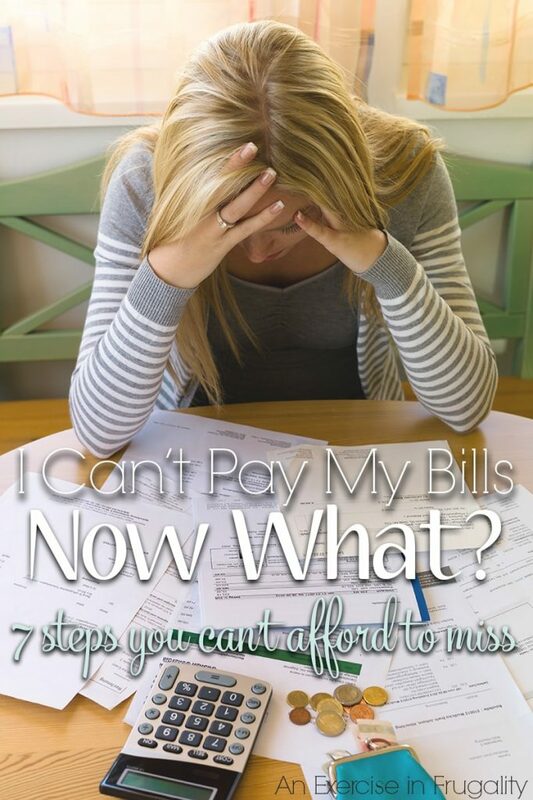 Have you been unable to pay your bills? What helped you through it? Can you tell I have been in this situation before? 😉 It’s not a fun place to be but it is possible to get out of it! Recently read to always be putting money back … change in a jar, moving a few dollars into savings, paying small amounts on a credit card before it’s due. On most days I take $5 or less & do something with it. Reason being is if you look at your monthly bills as something only to pay when they’re due when you have some $$ you think it’s yours to spend but that’s not true. You will always have some expense or bill to pay so it’s best to not get in the mind set that you have money to spend so you don’t come up short at bill time.